StemPod is an On-Demand Full-Convection herb and concentrate vaporizer attachment for box mods. Fully rebuildable and endlessly customizable. Please provide your email below for updates on product releases, promotions, and more. hits or in temperature control for easy sharing and precise dosing. from restrictive to wide open or anything in between. e-cigarette coils for a totally new experience, or craft your own heating elements. StemPod heats up instantly, at the push of the button. No frustrating session timers or accidental shut offs. This means StemPod is extremely efficient, and will enable you to get the most out of your material. 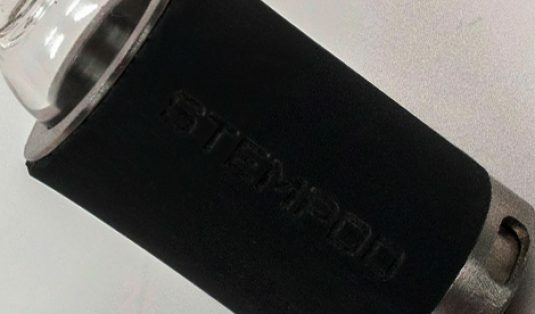 StemPod features dual adjustable airflow vents so you can experience the full range of vaping From mouth watering flavor to milky clouds, each session is as unique as you are. StemPod’s design makes cleaning and maintenance easy. StemPod can be fully disassembled which makes cleaning those hard to reach spots easier than ever before. StemPod has been engineered for 18mm glass stems making it compatible with most pre-existing glassware. The all steel and glass airpath produces the purest flavor and makes cleaning quick and easy. The StemPod body comes with a custom protective sleeve to keep the device comfortable to the touch even after extended use. The heating element is the personality of any herb vaporizer. That is why StemPod’s coil deck makes it easy to change heating elements. this gives users the power to customize their vaporizer’s performance, battery life, and efficiency to best suit their needs. StemPod’s universal 510 threading allows it to connect to any box mod. The StemPod body comes with a custom protective sleeve to keep the device comfortable to the touch after extended use. StemPod's universal 510 threading allows it to connect to any box mod. The heating element is the personality of any herb vaporizer. thet is why StemPod's coil deck makes it easy to change heating elements. this gives users the power to customize their vaporizer's performance, battery life, and efficiency to best suit their needs. An on-demand full-convection herb and concentrate vaporizer attachment for box mods.